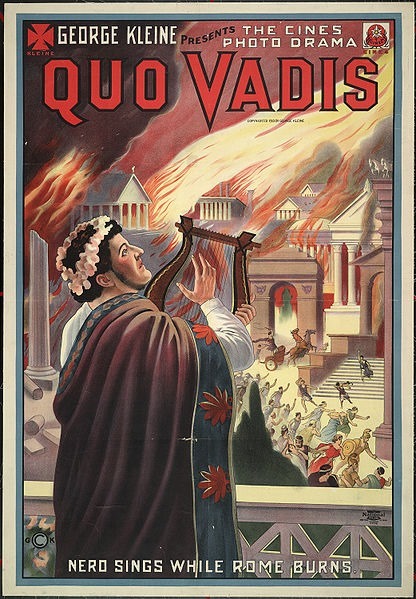 A popular (and generally debunked) legend has it that the Roman Emperor Nero played the fiddle during the Great Fire of Rome in AD 64. This story has given rise to the idiom “fiddling while Rome burns”, which means to occupy oneself with unimportant matters and neglect priorities during a crisis. Given the different rates of production between the public and private sectors, this idiom may be appropriate in the Albemarle County’s laborious discussion of potential business assistance for those impacted by the Route 29 Solutions. In yesterday’s (4/30) Route 29 Solutions Project Delivery Advisory Panel (PDAP) meeting, Lane-Corman, the contractor for the projects indicated currently they are on schedule and will meet or beat all the deadlines in the project timeline. The Design-Builder will receive a “no excuses” incentive payment in the amount of Eight Million Dollars ($8,000,000) if the Milestone One Completion Work is completed on June 29, 2016. 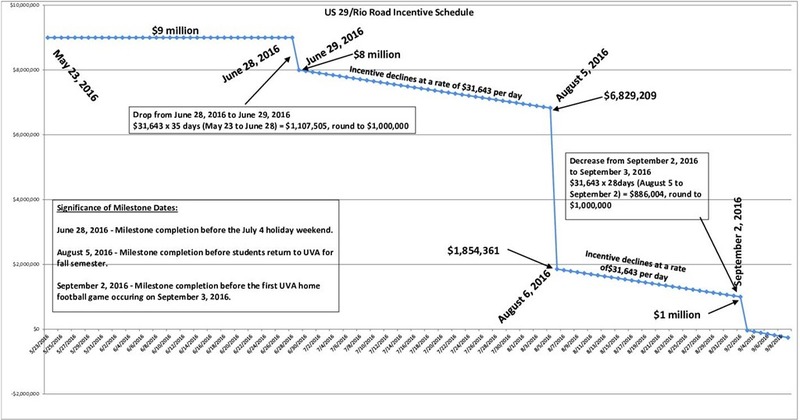 For every day after June 29, 2016 the Design-Builder takes to complete the Milestone One Completion Work, the incentive will decrease at a daily rate of Thirty One Thousand Six Hundred Forty three Dollars ($31,643) until August 5, 2016 when the “no excuses” incentive payment for Milestone One Completion Work will be Six Million Eight Hundred Twenty Nine Thousand Two Hundred Nine Dollars ($6,829,209). The Design-Builder will receive a “no excuses” incentive payment for Milestone One Completion Work in the amount of One Million Eight Hundred Fifty Four Thousand Three Hundred Sixty One Dollars ($1,854,361) if the Milestone One Completion Work is completed on August 6, 2016. For every day after August 6, 2016 the Design-Builder takes to complete the Milestone One Completion Work, the incentive will decrease at a daily rate of Thirty One Thousand Six Hundred Forty Three Dollars ($31,643) until September 2, 2016 when the “no excuses” incentive payment for Milestone One Completion Work will be One Million Dollars ($1,000,000). While the financial incentives seem to be keeping the private sector moving ahead of the agreed upon schedule, the same can not be said for the public sector. As a part of the PDAP meeting, Albemarle County’s Community Development Director Mark Graham revealed that the county’s long anticipated Business Assistance Program that was scheduled for discussion at the Board of Supervisors in May has been delayed and now will not be on their agenda until June. Graham cited the desire for increase business engagement as the rationale for the delay. The Free Enterprise Forum has advocated for the business assistance program to include a relaxation of sign regulations to increase the visibility of businesses impacted by construction [US 29 Business Assistance – The Least Albemarle Can Do]. In the April 16th meeting, PDAP Moderator Philip Shucet clearly indicated that the Virginia Department of Transportation (VDOT) policy does not govern business signs on private property. VDOT is appropriately focused on those things it can control in its right of way. 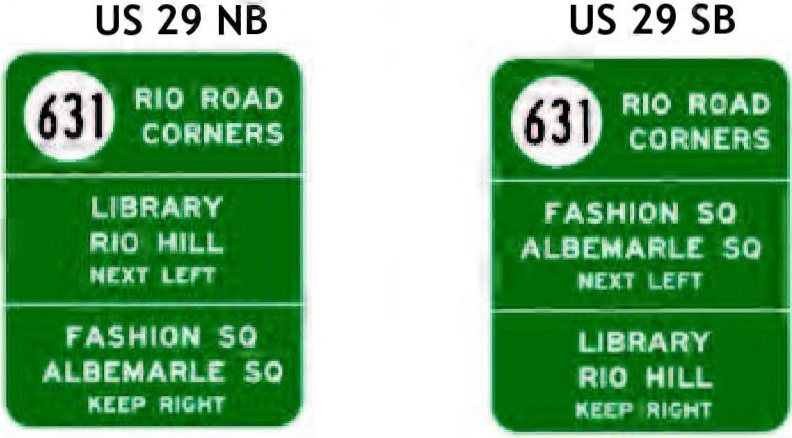 One may have differing opinions of the signage (or place names) currently under consideration but at least they are moving forward. Albemarle County has been discussing their business assistance program for over a year and now enterprises will have to wait another month to see what, if anything, the County will be willing to do to help them survive the construction and post construction period. In the time the County has been discussing this program the private sector has responded to the request for bids, had bids awarded, been given the notice to proceed and these transportation projects are underway. Considering the significant contact over the fifteen months between county officials and businesses and the speed of the construction projects – the Free Enterprise Forum finds this latest delay, to “better engage the business community”, difficult to swallow.